I’ve had puppy fever BAD lately. Could this little guy be any cuter? Obviously not. I love this look! I’m all about scarves and bright colors this summer. Isn’t this beautiful? 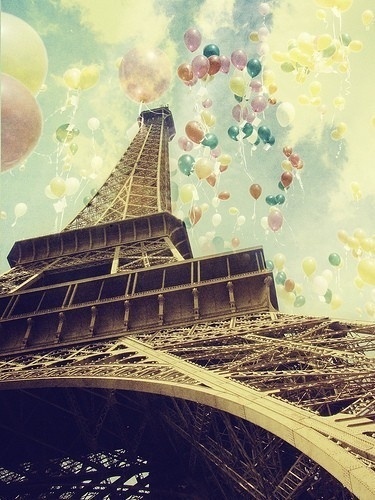 I just want to float right up after the balloons. I love love love this ring! Not your average hunk of metal, amiright? Brownie cookie dough sandwiches? I’ll take the whole batch, thanks. I hope your week is off to a great start! I’m off to a casual dinner with Jason, his dinner break starts any minute! For Puppy Fever: Take two costly heart worm pills and go to bed until it passes. Or set an alarm clock that goes off every few hours and must be taken outside in order to shut it off. Or gaze at a possession you really like, and then purposefully shred it beyond repair. Or go on an expensive trip, then write a large check upon your return (which you of course failed to calculate in your travel budget). Or pick a day when you are totally stressed and over-booked, and force yourself to go sit in a vet’s office for several unplanned hours…and then write another large check. The above prescriptions are most effective when combined. I love all these picks but especialllyyyyy that puppy! I’m dying for one as well, I can’t get it out of my head!